I still don’t get cricket! After pondering how my rucksack had gained 2 kilo’s, enjoying a reasonable 3 1/2 hour flight to Sydney with Meryl Streep as the Iron Lady for company, and then a quick commuter flight to Melbourne we arrived at our first port of call in Australia. We were staying in West Melbourne in Miami Hotel and a bargain $17 SkyBus took us there where we crashed into bed after a long day travelling. Saturday 18th Feb and our first day of exploring the city. We picked up some supplies and made, what has now become customary, cheese and relish sandwiches and then headed down Spencer Street to pick up the River Yarra for a leisurely stroll to Federation Square- the cities main plaza. Being a weekend there were plenty of rowers out on the water which I took great pleasure at watching (/scrutinising…they were novice crews!) Federation Square is known as ‘the place to meet’ but really its just a big square! They did have a Sustainable Living Exhibition on though so there was lots of stalls pushing all things ethical and green which was interesting to browse through. Plus there were nice deck chairs in the sun to eat our sandwiches for lunch. But my goodness was it hot! 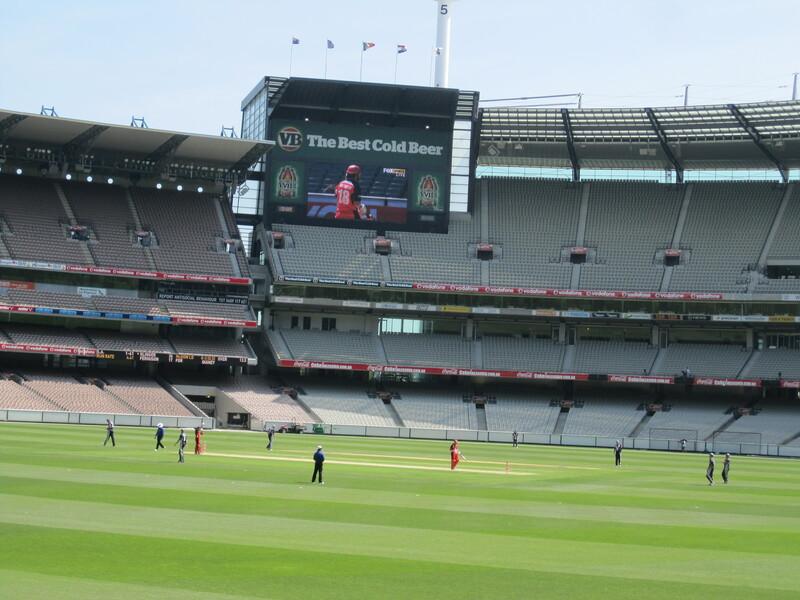 We continued the fight against desiccation during a stride to the MCG- Melbourne Cricket Ground. And it is within this massive oval structure where we attempted to educate ourselves in the sport of cricket, buying a bargain $10 Domestic One Day Cup Match ticket, Victoria vs South Australia. We didn’t get off to a great start, choosing to sit in level 1 (padded seats you see) and in the shade. The atmosphere up there was nill and it was cold and we found ourselves dozing off with just a big cold gust of wind waking us up each time! So we decided to head downstairs to ground level to sit in the sun with more people around us. Still not a huge amount of atmosphere, just not enough of a crowd, but the pints of cider and snacks helped us get into the game more. This sustained us for 12 overs, 1 1/2 hours of play. And then we just lost the enthusiasm to live again, but agreed to stick it out to 25 overs- 1/4 of the game. We were rewarded with 1 catch out! So 25 overs came and we made a quick exit, agreeing that we were more 20-20 people than the die-hard fans that are able to endure 100 overs. 100 overs! Goodness me, they are blessed with more patience than me! We walked from the MCG over the river to the very lovely looking boathouse’s that line the Yarra River. This also gave me a chance to sneak a look into see what boats they had- all top of the range Filippi and Empachers, very nice. Before I got caught for snooping we continued our stroll along the river to Southbank- a fancy area full of bars and restaurants. As we mooched about with our ice creams we had just purchased, it struck us both that Melbourne would be an ace city to live in in your 20’s and 30’s if you earned enough to enjoy its cosmopolitan chilled hide aways. It had a very compelling chilled out yet lively vibe which we liked. Crossing the river again at Kings Street we hopped onto the City Circle Tram which is a vintage style tram which goes right around the city with a little commentary pointing out the key sites you are passing along the way…and its free-woop! We went along Harbour Esplanade, past the Etihad Stadium to New Quay and the Waterfront City Docklands and then back into the City to Spencer Street where we hopped off to walk back to our hotel. Sausage salad for tea which we cooked in the hotels little kitchen then bed; pleased with ourselves that we’d done a lot with our first day in the city. It’s all kicking off this morning in Canberra with a potential leadership challenge, Julia Gillard vs Kevin Rudd. We watched the GMTV equivalent news program with interest with our wheetabix and both agreed that the whole thing was ridiculous. She’s no Maggie Thatcher but by the sounds she not doing a bad job. Today we headed to the beach- St Kilda to be precise which in South of the city along the coast. 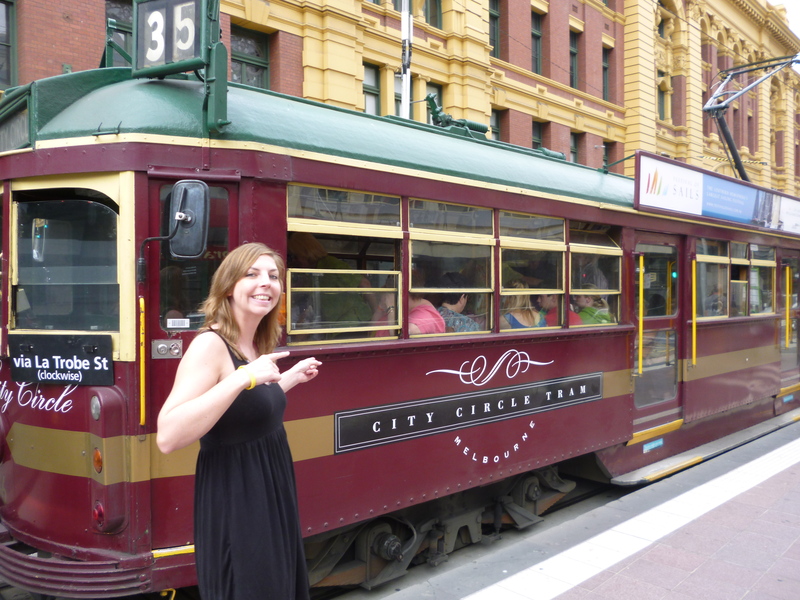 We caught the city circle tram again and completed the loop passing Flagstaff gardens, the State Library of Victoria and Parliament House; hopping off at Federation Square to catch the number 16 tram to St Kilda. (Top tip- buy a Sunday Saver travel card at Finders Station to get unlimited travel for $3.50…bargain!) After around a 20 minute tram ride we arrived in St Kilda- a very bohemian place full of artist and musicians. Every Sunday a market fills the Esplanade selling arts and craft items and I enjoyed browsing the stalls before we headed to St Kilda Pier- the site of many Royal visits apparently back in the day. At dawn and dusk you also may get a sight of the St Kilda Penguins; at 11am all we saw were their droppings! was sponsored by Garnier so as we walked through the event we got loads of free samples of shampoo, moisturiser, makeup and deodorant which I loved! Then we sat on a massive Garnier branded bean bag to watch the volleyball tournament in the glorious sunshine. And all for free, we couldn’t believe our luck! First up was the Men’s Semi Finals, then a celebrity match and then came the Women’s Final. It was great fun and the commentators were brilliant and we had a constant supply of ice-cold ice tea for free from the Lipton Stand. It must have shown that we were having an ace time as we got snapped by the Garnier photographer to be uploaded to their website! After whiling away the afternoon we walked back to the Esplanade and caught a crammed number 16 tram back to the city. Picked up a can of baked beans on the way home for a cheapo student dinner and enjoyed it watching Harry Potter on the telly. All in all an ace and inexpensive day in the city. Monday 20th and time to say bye to Melbourne as we caught a taxi back towards the airport to pick up our Hippie camper van to start our Aussie road trip. The Great Ocean Road here we come…! Look out for…=…free festivals, sporting events, exhibitions- this cities full of them! I was really looking forward to Melbourne. I’d heard a lot of good things, great food, great nightlife…but unfortunately when you’re a traveller low on funds and eating beans on toast of dinner – Melbourne isn’t that great. On the Saturday we went to a cricket match. This is the first time I’ve ever been to a cricket match and it will probably be my last, it was so, so bloody boring. It was only really enjoyable when we shared our one cider – we left after 25 overs (about half way through the game – couldn’t stand any more!). Now, on the Sunday we went to St Kilda and enjoyed a lovely free day courtesy of the Garnier and Lipton Ice Tea sponsored volley ball tournament. Now this was fun, and before you say it not because it was girls in skimpy outfits (Volley Ball girls are too skinny and have no curves anyway!!). The men’s match that we watched was an enthralling match that went the whole distance to the 3rd set. I had no idea it was such a physically demanding game. Much more entertaining than the cricket and it was free, which as someone who’s been travelling for over 4 months now, you really appreciate the free things in life!